Welcome to the Visible Body Blog! 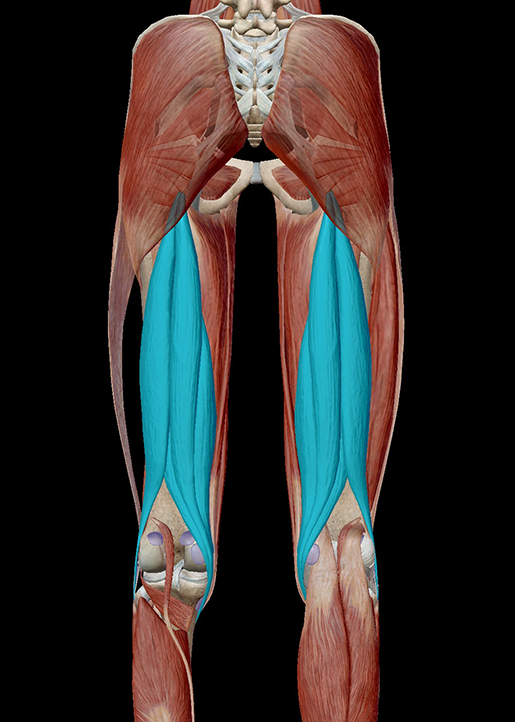 Rotate the 3D model to see the hamstrings, a group of muscles on the back of the thigh. It’s no secret that exercise is an important component of keeping our bodies healthy, and athletic activities are a great way to have fun while we challenge and express ourselves. In our endless creativity, we humans have developed a huge variety of games, hobbies, and art forms that give our bodies and minds a good workout. Unfortunately, being physically active can sometimes lead to injury. There is a lot we can do to prevent getting hurt — warming up properly before exercising, making sure our muscles are both strong and flexible, wearing the proper gear, and so on — but accidents still do happen. There’s no need to panic, though. You don’t need to hide in your house and never play your favorite sport again. Video footage from Muscle Premium. Instead, think of this as a chance to become more informed about the kinds of injuries humans experience while at play. Because empirical studies make the scientific world go round, I’m going to use these frequencies as a guide for our exploration of the wide world of sports injuries. And because I love making lists almost as much as I love empirical data, I’m going to discuss these types of injuries from least to most prevalent. So, without further ado, LET’S GET READY TO RESEARCH — I mean, RUMBLE! As tempting as it is, I’m not going to start off this section by making a pun about the humerus. That’s mostly because it’s really painful when the humerus becomes dislodged from the “socket” of the shoulder joint. Image from Human Anatomy Atlas. 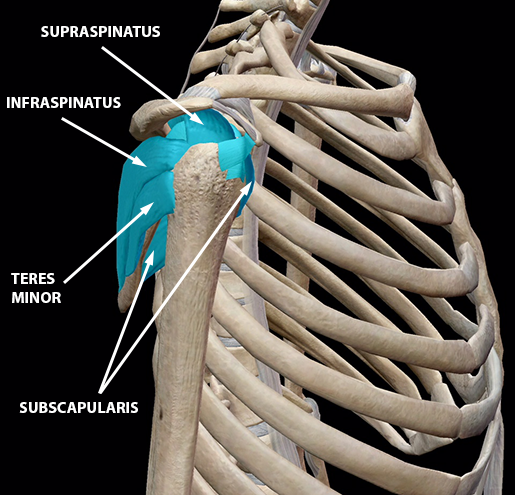 The top of the humerus usually fits neatly into the cup-like portion of the scapula, held in place and supported by connective tissue that includes the glenoid labrum, an assortment of ligaments, and the tendon portions of the rotator cuff muscles (infraspinatus, supraspinatus, teres minor, and subscapularis). A sudden impact can ruin this harmonious arrangement, pushing the humerus forward, backward, or downward and popping it out (or partially out) of place. The connective tissue surrounding the joint can tear, causing additional pain and inflammation. Shoulder dislocations are common in contact sports like football and hockey, as well as in sports like skiing, snowboarding, or gymnastics, in which falling is a significant risk. The humerus can also be dislodged in accidents occurring outside of sports like auto accidents and falls around the house. No matter how the dislocation happens, it is important to work with a medical professional who can guide you through physical therapy exercises to maintain the shoulder's range of motion and the strength of the muscles around the joint. 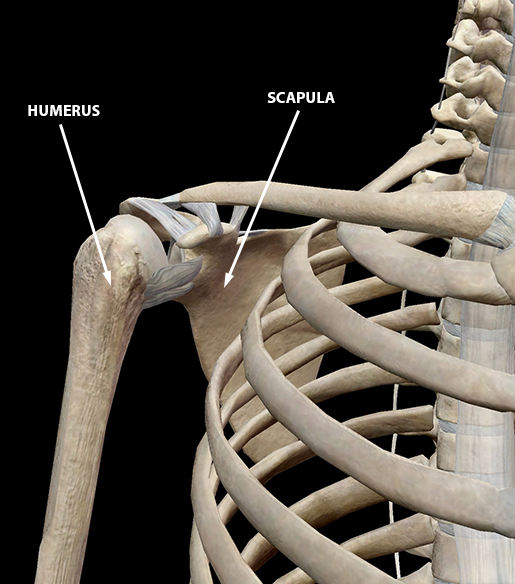 If the shoulder is immobilized for too long, the capsule of connective tissue surrounding the top of the humerus can become thick and tight, causing a condition called adhesive capsulitis (aka frozen shoulder). As someone who loves brains (don’t worry, I’m just a neurobiology nerd, not a zombie), traumatic brain injury (TBI) is no joke. One form of TBI is the concussion, which is common in football and soccer. Non-sports causes include falling, unintentional blunt trauma (being hit by an object), and auto accidents. Essentially, a concussion happens when your brain slides around and hits the inside of your skull. Instead of sitting right up against your skull, your brain is wrapped in three layers of tissue (the dura mater, arachnoid, and pia mater) called the meninges. It is further cushioned by cerebrospinal fluid between the arachnoid and pia mater. 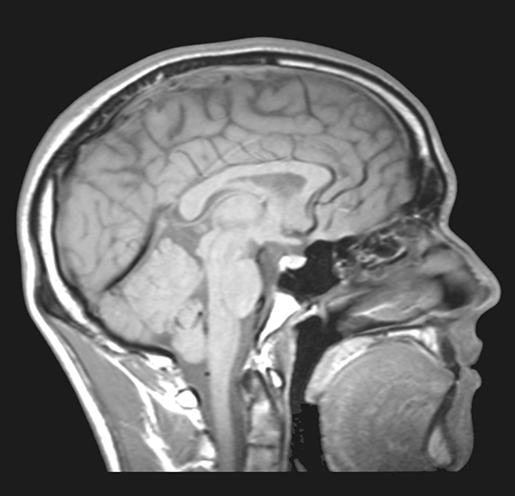 The meninges and CSF keep the brain in place through everyday motion and protect it from impacts. See what I mean? The brain doesn't sit right up against the skull. Images from Human Anatomy Atlas. However, a forceful blow to the head or sudden acceleration or deceleration (from a car crash, for example) can cause the brain to move around more than it should. 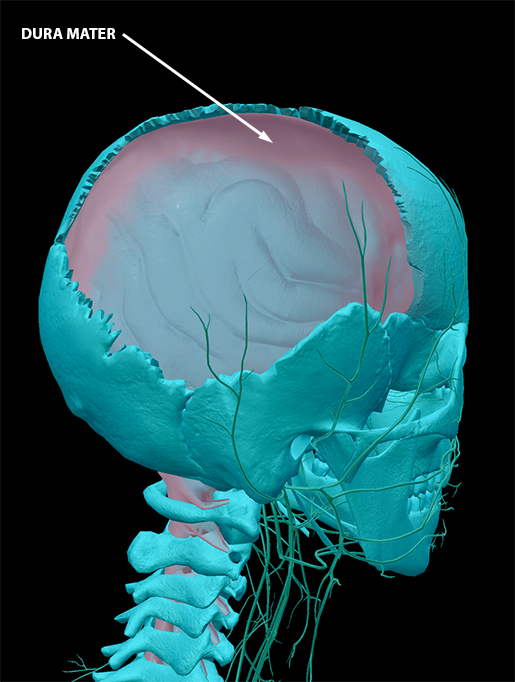 Sometimes the brain will make impact with the side of the skull opposite the original trauma, resulting in a contrecoup injury. The primary method of treating a concussion is rest. It’s time-consuming and can be frustrating, but full recovery from a concussion is possible if you follow your doctor’s recommendations and take enough time off from activities that might result in a second concussion. Receiving a second concussion before the first is completely healed can be extremely dangerous, leading to potentially fatal brain swelling. Receiving repeated brain injuries — even “mild” ones — over a long period of time can take its toll on the brain as well. Wearing appropriate protective gear, such as a helmet, when engaging in athletic activities is a good idea. Please be careful with your brain — you only get one! A contusion is a fancy word for a bruise. This is probably the one item on this list that everyone can say they’ve suffered from at some point, whether from falling off a bicycle, getting in a really intense bout at fencing practice, or walking into a wall or door-frame (that happens to other people too, right?). Bruising usually occurs as the result of a sudden impact or trauma like the ones described above. Tiny blood vessels at the site of the impact break and blood leaks out into the surrounding tissue (i.e., your skin). Some contusions are more severe than others, and complications are definitely possible — hematomas, for example. A hematoma happens when the blood leaking out of broken blood vessels pools and clots, creating a painful, swollen bump. Serious accidents, especially those involving sudden acceleration or deceleration, can bruise more deeply than the skin or muscle. Bones can bruise, as can the internal organs. Contusions in an organ can cause dangerous internal bleeding, and in the brain, they can lead to fatal swelling called cerebral edema. The good news is that your body is most likely pretty good at repairing minor contusions. Usually, a bruise will be red early on and then will go from bluish-purple to greenish-yellow as it heals. These color changes are caused by the breakdown of hemoglobin in the leaked blood. Sticks and stones can break your bones, but so can accidents and overuse related to athletic activity. An acute fracture occurs when a bone breaks because of sudden trauma, such as a fall or a forceful impact. Even within this category, there are a number of different types of acute fractures (as shown in the image below). A closed (simple) fracture is exactly what it says on the tin: there’s a broken bone. 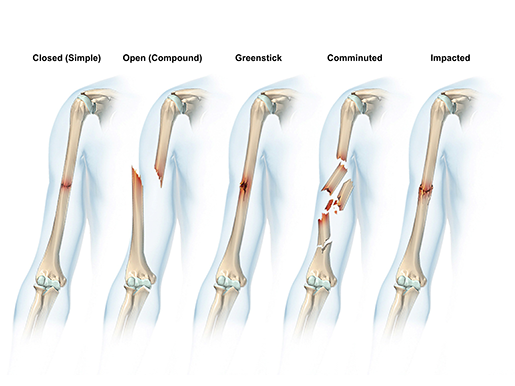 When a bone breaks and pokes through the skin, that’s called an open (compound) fracture. A greenstick fracture is one in which the bone has bent or cracked but it hasn’t broken all the way. Bones can also shatter into several different pieces, as in a comminuted fracture, or one piece of bone can be pushed into another, as in an impacted fracture. Not all fractures happen in a single instant. Stress fractures, for example, are hairline cracks caused by overuse. 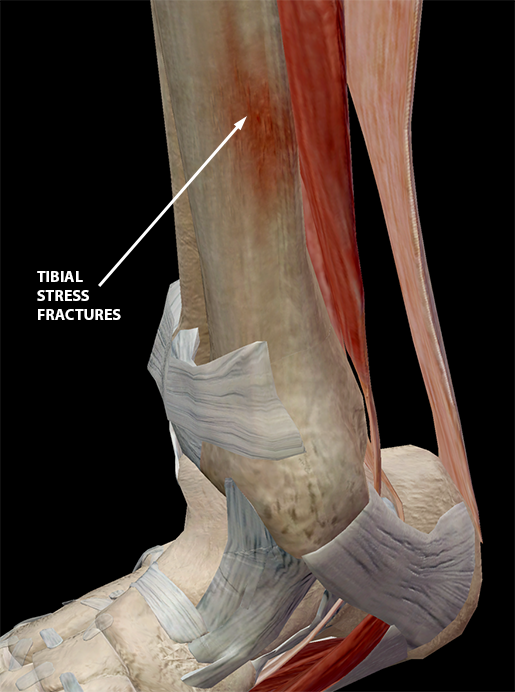 Here you can see stress fractures in the tibia. The foot and ankle are common sites of stress fractures in athletes whose sports require frequent repetitive, intense motion such as running or jumping. In the case of the tibia, the muscles of the lower leg eventually become too fatigued to absorb the shock, and the bones “take over” instead. The result is tiny fractures on the bone. Metatarsal stress fractures are also fairly common in runners and, in my own personal experience, ballet dancers. For acute fractures, splints or casts are often used to keep the area around the fracture immobile. If a fracture is severe enough, fixing it might require surgery (pins may be put in to provide extra stabilization while the break heals). Stress fractures may also require a cast or brace of some kind — when I had a stress fracture on my second metatarsal, I had to spend several weeks wearing a big moon-boot-looking walking cast! All fractures require proper rest in order to heal, so taking a few weeks off from athletic activity is usually necessary. And now for the most commonly reported sports injuries: strains and sprains! They may sound alike and have similar causes, but strains and sprains are most definitely distinct from one another. If you’ve ever pulled a muscle, you’ve experienced a strain. Maybe you didn’t warm up before doing a split, or you lunged a little too far to catch a ball that was out of your reach. Strains involve muscles or tendons being overstretched and/or developing tears. They can be caused by overuse or by sudden overextension or stretching of a muscle. The hamstrings, a group of muscles on the back of your thigh, are often strained during athletic activity. Sprains involve the tearing and/or overstretching of ligaments. They happen most commonly in ankles and knees as a result of falling or landing badly from a jump. 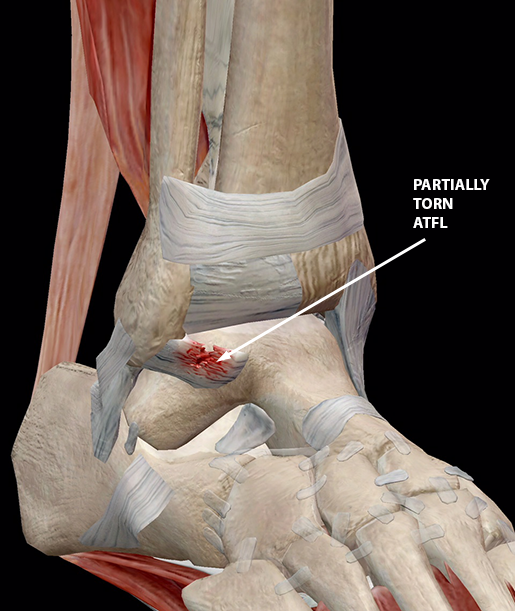 In the first image below, you can see that the anterior talofibular ligament (ATFL) is torn. 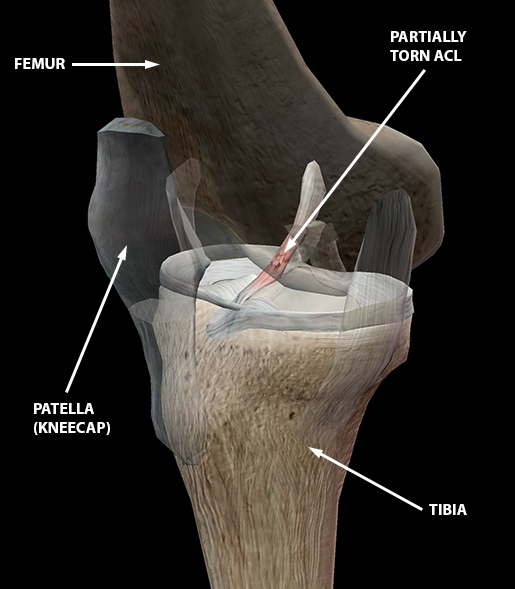 The second image shows a partial tear of the anterior cruciate ligament (ACL). The RICE (Rest, Ice, Compression, Elevation) method is generally recommended for the treatment of sprains and strains. Though some recent research has challenged elements of the prevailing wisdom on RICE, the best plan if you have an injury is to see a medical professional ASAP! Though accidents still happen, there are definitely steps you can take to help reduce the risk of injury. Make sure to use proper safety equipment, do appropriate warm-ups before intense exercise, maintain proper technique, and keep up with stretching and strength conditioning. Now get out there and enjoy your favorite sports — safely, of course! Be sure to subscribe to the Visible Body Blog for more anatomy awesomeness! Are you a professor (or know someone who is)? We have awesome visuals and resources for your anatomy and physiology course! Learn more here. To Ice or Not to Ice?